What's the best time to visit Tokyo? What's the weather like in Tokyo in each month? When are the best festivals and events in Tokyo? Here is my comprehensive guide. You can visit Tokyo at any time of year because the weather is temperate. Summer (late June to the end of August) in Tokyo is hot and humid. Winter (December/January/February) in Tokyo is cold but not too cold for traveling. The rainy season goes from mid-June to late July, but it does NOT rain every day and you can travel. January tends to be clear and cold. It rains or snows a few times during the month. The snow usually doesn't stick. Most businesses are closed from December 29th to January 3rd for the shogatsu (New Year's) holiday. This is a quiet month in terms of crowds (except for at the shrines during shogatsu). 1, 2, 3 January: Hatsumode (first shrine visit of the New Year). Popular spots include Meiji-jingu Shrine,Yasukuni-jinja Shrine and Senso-ji Temple. Winter continues into February. This is generally a dry month but it can rain or snow a bit. If it snows, it doesn't usually stick on the ground. This is another good month to visit if you don't like crowds. 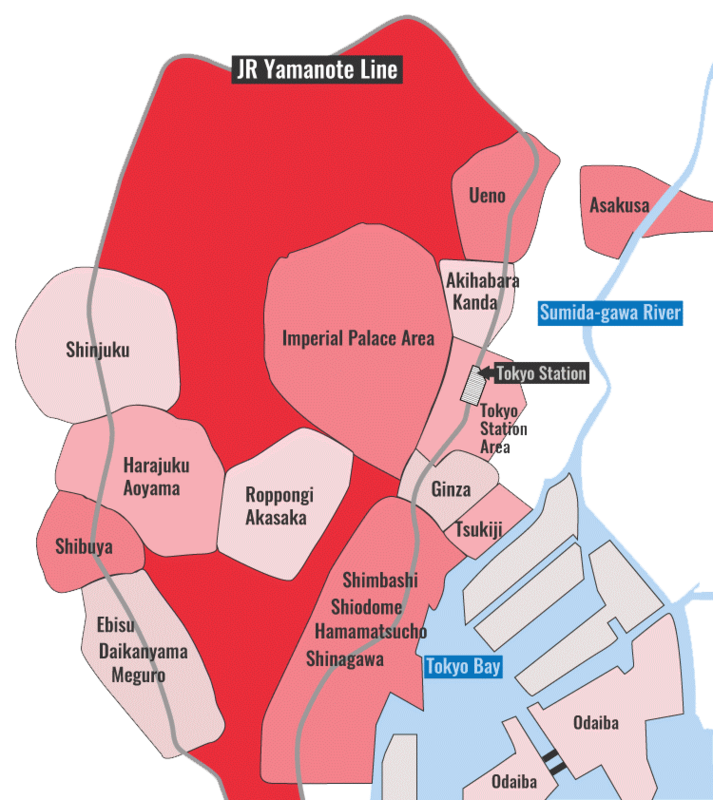 2 February: Imperial Address at the Imperial Palace. On this day, you can enter the inner courtyards of the Imperial Palace to hear the Emperor give his New Year's address. March is when it starts to warm up in Tokyo, but the weather can range from cold to quite warm, so be prepared for anything (bring clothes that are easy to layer). In mid-March, the plum blossoms come out. At the end of March, the cherries usually start blossom. Most of March is uncrowded, but the last week tends to be busy with tourists (book well in advance). Third weekend in March: The Tokyo Anime Fair. Held at the Tokyo Big Sight event hall in Odaiba, this is one of the world's top gatherings for anime fans. Late March: Hanami (cherry blossom viewing): The cherries usually start opening in late March. 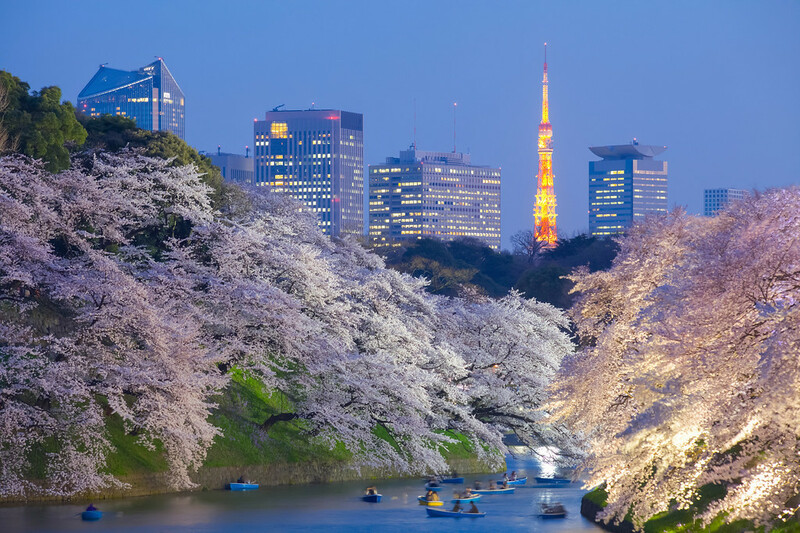 Top spots to see the cherries include Ueno-koen Park, Yoyogi-koen Park and Shinjuku Gyoen. Spring really starts in April. The first week or so is peak time for tourism in Japan due to the cherry blossoms. If you want to visit in April, book well in advance! The tourist areas of the city will be packed during this time. The cherries usually peak sometime in the first week of April and usually hang on until around 15 April (but fall earlier in rainy years). The weather can range from chilly to quite warm, so bring clothes you can layer. The second half of the month tends to be uncrowded and lovely. Early April: Hanami (cherry blossom viewing). The cherries usually peak in the first week of April. Top spots to see the cherries include Ueno-koen Park, Yoyogi-koen Park and Shinjuku Gyoen. May is perhaps my favorite month in Tokyo. It's warm but not hot and the skies are often sunny. There are lots of things in bloom in the parks and gardens and the new green of spring is beautiful. And, it's not a busy tourist season. Evenings and mornings can still be a bit cool, so bring a light top layer. Early May (bi-annually): Kanda Matsuri. Held every other year (the next one will be in 2017), this huge festival is held in the Kanda district of central Tokyo. Third weekend of May: Sanja Matsuri. This is Tokyo's biggest festival (making it one of Japan's biggest). The action takes places all around Asakusa. Don't miss it! June is a great time to visit. The weather is reliably warm but it's not yet hot. It's usually sunny at the start of the month and then the rainy season starts later in the month. It doesn't usually rain every day or all day (but you can expect a lot of afternoon showers – so bring a portable umbrella). Mid-June (bi-annually): Sanno Matsuri. Held every other year, this festival and parade centers on Hie-jinja Shrine. The next one will be held in 2016. The rainy season lasts into July and it is usually hot and humid with frequent rains. Still, it's possible to travel in Tokyo in July and it's not crowded. The rainy season ends at end of the month, and then it becomes sunny, hot and humid. 13-16 July: Mitama Matsuri. This festival, held at Yasukuni-jinja Shrine, is held to remember the dead (mostly Japan's war dead). It's a nationalist event that might be of interest to those interested in Japanese history. Last Saturday in July: Sumida-gawa Fireworks Festival. This awesome fireworks festival is held at the Sumida-gawa River in Asakusa. Highly recommended! August is the hottest month in Tokyo. It can be sweaty work sightseeing in August, but the advantage is that there aren't many other foreign tourists. Long-distance transport like shinkansen (bullet trains) are crowded during the Obon holiday, which usually falls in the middle of the month (check online for this year's dates). Mid-August: Obon. This is the Buddhist festival of the dead, when Japanese return to the their hometowns to offer prayers to their ancestors. Transport is crowded during this time. The dates vary by year so check online for this year's dates. Mid-August: Tokyo Pride. This LGBT pride event is held in Yoyogi-koen Park and continues into nearby Harajuku. Check online for the latest details. Last Sunday in August: Asakusa Samba Carnival. Japanese fans of samba, many of whom are Brazilian-Japanese, perform a fantastic samba dance through the middle of Asakusa. The event is popular with photographers who clamor to get the best shots of the scantily-clad ladies. September is an excellent time to travel in Tokyo. It's usually sunny, hot and humid at the beginning of the month, moderating to sunny and warm at the end of the month. This is low season for tourism and hotels can be a bargain. Mid- or late August: Tokyo Game Show. Fans of electronic games gather at the Makuhari Messe event center in nearby Chiba to check out the newest offerings. October has some of the best weather of the year: sunny and warm days are the rule, with cool evenings. It's a very comfortable time to travel. At the very end of the month, the leaves start to change color in the city's parks and gardens. All month: Chrysanthemum festivals: These events are held at various gardens, shrines and temples around town to celebrate these flowers, which come into bloom in October. Ask at the tourist information center for details. November rivals May as my favorite month to visit Tokyo. The weather is usually cool and sunny skies are common. The leaves turn color this month and the foliage in the city's parks and gardens is spectacular. 3 November: Jidai Matsuri (Festival of the Ages). Held on National Culture Day, people dressed in costumes representing various historical periods in Japan march in a parade in Asakusa. Winter really starts in December and temps range from cool to cold, but it's certainly not too cold for sightseeing. This is generally a dry month but it can rain or snow a bit (it usually doesn't stick on the ground). If you don't like crowds, this is a good time to visit, but keep in mind that things shut down from December 29th until January 3rd for the shogatsu holiday. Early December (bi-annually): International Robot Exhibition. Held every other year at Tokyo Big Sight event hall in Odaiba, this is a gathering of the world's top robot makers (many of them from Japan). The next will be held in 2017. 31 December: Shogatsu (New Year's): People gather in their homes to celebrate the New Year. Many people visit temples to ring the temple bells at midnight approaches. After midnight, many people visit a shrine to pray for good luck. A good spot to see this is Meiji-jungu Shrine.